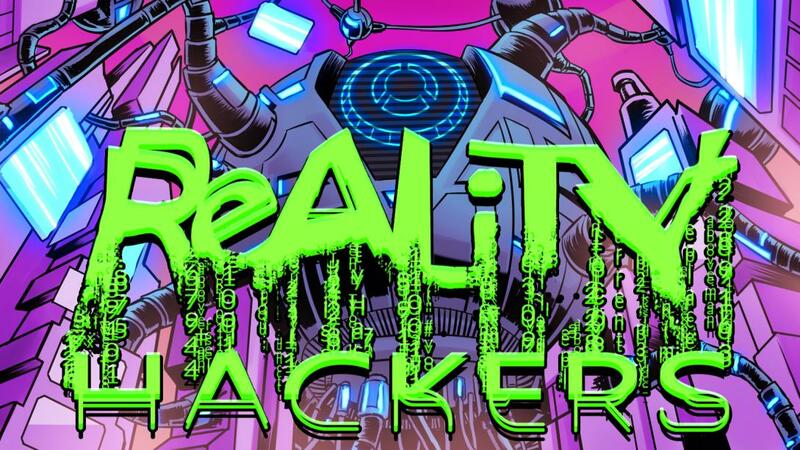 Just a few days into its Kickstarter campaign, the comic Reality Hackers has already received a groundswell of support. 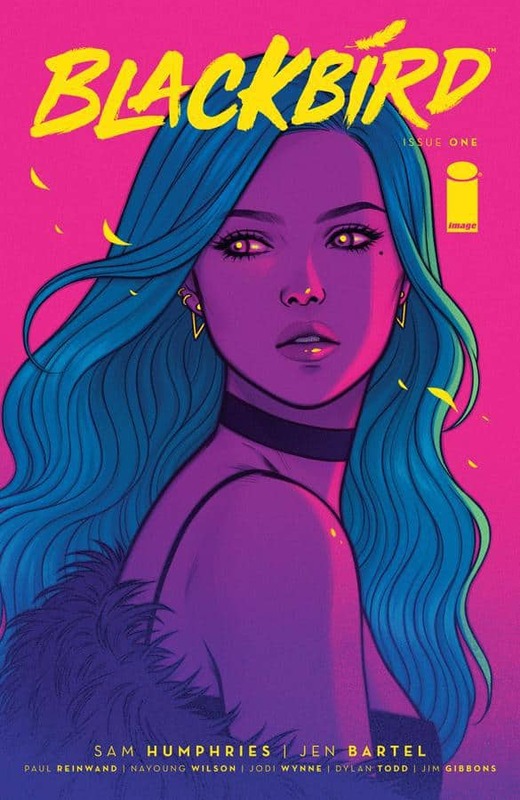 With a unique aesthetic and a synopsis that seems right up the alley of the cyberpunk lovers of the community, it’s hard not to be excited for the three issue mini-series. 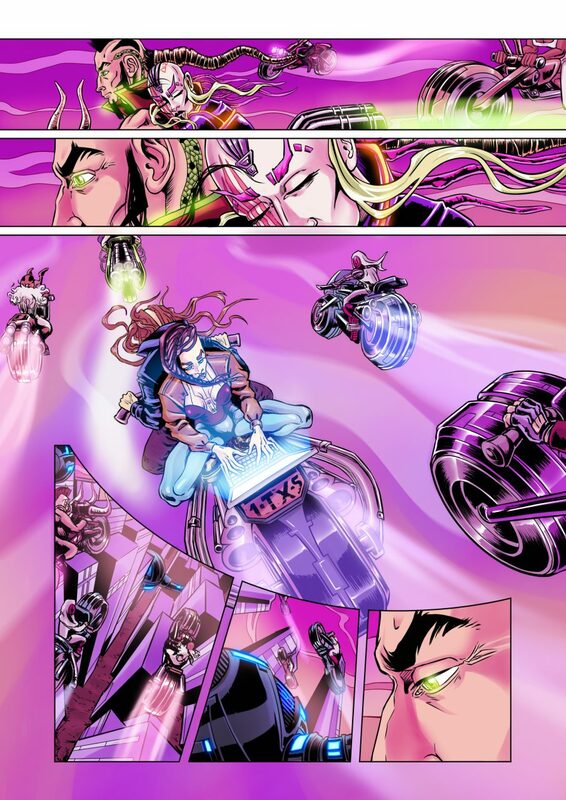 NewRetroWave’s Comic Book Editor Joey Edsall had the chance to interview writer and artist Aimée McLernon, the mastermind of Reality Hackers, so you can get to know more about this upcoming comic. JE: How did you get into making comics? What’s your origin story? AM: As a child I was always drawing comics. As far back as I remember, if I had a blank page I would turn it into a grid and tell sequential stories with various original characters. So it’s something I always remember doing and always wanting to continue with. My grandmother would buy my weekly copy of the Beano and the Dandy which were popular British children’s comics, so I think I got a lot of inspiration from those at a young age. JE: Speaking of origins, what is the origin of Reality Hackers as a comic? When did it come to you? AM: Reality Hackers has been the result of piecing together ideas and characters that I’ve developed over several years, taken from a lot of different areas of thought. I knew I wanted to make a science fiction/fantasy comic pretty early on as I was always drawn to that type of artwork and fiction. Over time I realised my favourite aesthetic was cyberpunk, as I found myself consistently drawing characters with wires and various bodily mods. I’ve also always been interested in reading about a wide range of philosophical subjects and researching into different areas, so I wanted to write a story attempting to integrate my understanding of these subjects. Three major areas that influenced me are psychedelic culture, transhumanism and the occult. These themes appear in the comic, with the main premise of ‘reality hacking’ being a form of ritual magic spliced with computer hacking. You might notice there are no guns or other weapons in the comic, which kind of sets it apart from other cyberpunk titles. This isn’t a comment on guns or gun violence but more representative of the fact that the struggle the characters face is of a spiritual and psychological nature rather than a physical one. The message I wanted to express with the story has changed over time as I’ve worked on it, and as my own viewpoints and studies have progressed, but it is ultimately an exploration on the effects of transhumanism and how this can impact human identity on a philosophical, spiritual and psychological level. JE: What other artists are your inspirations? AM: In terms of comic art, I was heavily influenced by Darick Robertson’s work on Transmetropolitan. It’s a great expression of political cyberpunk, and since it was drawn a few decades ago, it also has a kind of nostalgic feeling to read it now. I also love that Spider Jerusalem’s character was based on Hunter S. Thompson, and I’d say his writings had a big influence on me as a teenager as well. I definitely like to include elements of psychedelic aesthetic and culture in my work even if I don’t necessarily place myself within that world. Grant Morrison’s The Invisibles is another example of a psychedelic and occult-inspired comic which I really like the vibe of. Sam Keith’s The Maxx was another huge influence on me, as I grew up watching the trailer for the animated series on my VHS of Beavis and Butthead Do America. As soon as I got access to the internet I discovered the full series, and that it was based on a comic, and when I read those I was hooked. It’s my favourite comic series to this day. Keith’s art style is unique, weird and technically skilled all in one, which is something I try to emulate. I love the fact that it starts off as quite an unconventional superhero story with a big purple guy, but deepens into a complex interaction of each character’s psychologies. Aside from comics, I’m heavily influenced by late ‘80s/early ‘90s cyberpunk anime, ‘90s children’s cartoons like Thundercats and Teenage Mutant Ninja Turtles, the works of H.R. Giger, Hieronymus Bosch and classic airbrushed fantasy art. JE: As an experienced visual artist, what was your approach to narrative like? Did you come up with story first or character design and worldbuilding? Or did the two happen in tandem? AM: I’d say it has definitely always been a co-constitution of the two in my process. I created the base designs of the characters first while doodling, and then built a story and world up around them while simultaneously developing their design in line with this. For a few years I worked in a carpet factory where I would listen to podcasts most of the day, in the subject areas mentioned earlier, and I would get tons of ideas for scenes, dialogue and main events in the story while doing that. So I’d take notes on my phone and then when I got home I’d put them into my file of ideas. Then I’d spend time going through all of it and piecing together a story. This never happened linearly, it was always like putting together a jigsaw puzzle of ideas and concepts and how I wanted to express these through the characters and their interactions. A lot of them time I’d experience synchronicities, where a random idea would seemingly fit seamlessly into a slot of the story which wasn’t yet filled and make perfect sense in alignment with both earlier and later parts of the story. That was an interesting process and always made me feel like I was on the right track. JE: With this being a 3 issue mini, do you already know how everything ends? AM: Yes – it will culminate in a direct confrontation between the hackers and the AI, but I won’t give away how that ends. Actually, while this first volume of 3 issues will be a mini-series which can stand on its own, I’ve also drafted the script for a longer running story as well – about 24 issues in total. I started drawing these a few years ago, but I sort of see that as a practice run as I don’t think they are really at a publishable level, and I want to rework and redraw them. This mini series is based on some of the same characters, using it as a chance to develop them a bit more, with some tighter world-building, creating a shorter form story which can stand alone but which can also form the basis for reformulating and continuing the main story. So it’s kind of part of a bigger project which I hope to continue in the near future. and hopefully create something which people can get more invested in if these first few issues are successful. 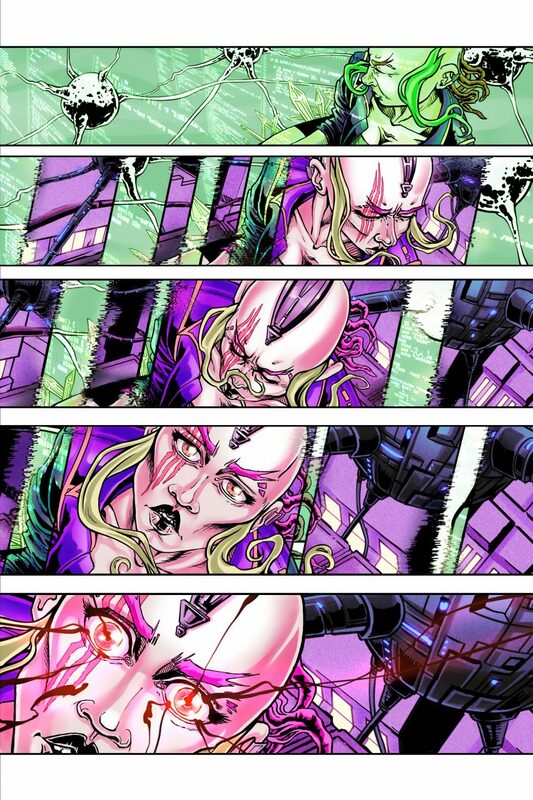 JE: Synthwave artist Vosto created the theme song for the comic. What was that collaboration like? AM: I knew Vosto had already made a soundtrack for another comic called Death Sworn by Karl O’Rowe, and that he had done a really good job on that. So I thought it would be a cool idea to ask him for the same, which I could then also give away as a reward on the project’s Kickstarter campaign. Vosto has a lot of similar tastes to me in terms of art and aesthetics and he has a good understanding of how to create soundscapes which complement those visual styles. I sent over a copy of the unfinished comic and asked him to create something based off of that, something which would capture the overall vibe of the comic. Within a few days he had come up with a really interesting basis of a track! He worked on it some more and I only had a few suggestions on how to change it, resulting in what I think is a really strong piece of audio reflecting the various elements of my story – the dystopia, the cyberpunkiness, but also a sliver of hope. JE: What’s the meaning behind the volume’s title of “Heritage”? AM: The first issue explores one of the main characters back stories and his relationship to the technological overlords in the society, and how he stands out from others in this world. I don’t want to give too many spoilers away but I think it will be pretty clear to people when reading the first issue why I chose this name. JE: The aesthetic is of Reality Hackers is unique, and seems to feel like it has a little bit of everything — the 90’s, 80’s, and present comic visual styles all seem at home in the world of the comic. Was any of that a deliberate choice or is it the way you naturally approach artwork? AM: That’s interesting – I don’t think I necessarily tried to do that on purpose. My conscious influences are definitely from the ‘80s and ‘90s but I haven’t thought much about how more contemporary styles present themselves in my work. I do look at a lot of modern cyberpunk art so that could be why, although I also try not to emulate it too much as sometimes I think that, even though it’s all really cool, it can all become quite similar looking. I’d love to be able to do those highly detailed digital cyberpunk paintings and concept art, but at the same time I’m glad I’m doing something a bit more unique and personalised. JE: Are there any comics that you are currently reading that you really love? AM: I’ll admit that I’m not the sort of comic reader that religiously keeps up to date with all the newly released titles. However, the last few titles I did check out were Jason Shawn Alexander’s Empty Zone, and Jeff Lemire and Dustin Nguyen’s Descender. These were both really cool, interesting stories and both have unique, traditional art styles, with Alexander’s rough and messy inks and Nguyen’s beautiful watercolours. I find myself staring at each panel for a long time in works like these and it inspires me to try doing more traditional-based work in the future as I’ve been working entirely digitally for this present issue. JE: Did any movies, TV shows, or music inspire you while creating this comic? AM: I’ve talked about my love for old-school cyberpunk anime and ‘90s kids cartoons – those will always be close to my art and inspire my style on some level. In terms of other TV shows, I loved the Mr. Robot series and although it’s not technically futuristic I’d still call it cyberpunk. With music, the synthwave genre has played a huge role in influencing me and I often work while listening to synthwave radio or mixes. The ‘80s retro vibe probably plays well with my other influences. I do believe it has been the sole contributor to my choice of colour scheme as well. Alongside that I also find that ambient soundscapes and video game soundtracks have helped the process of this comic along quite well. JE: Do you have any comics or characters that you want to draw one day? 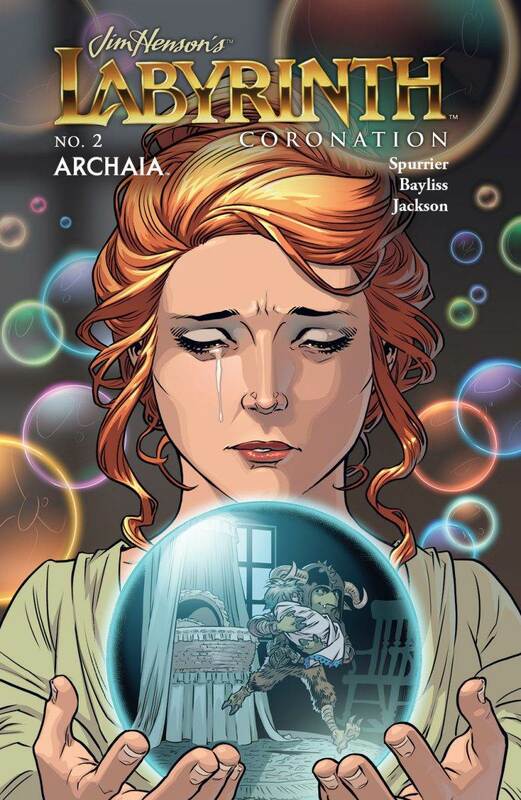 Or do you see yourself ideally sticking with the creator-owned route? AL: Aside from doing fan art I will probably stick to developing my own characters and story lines. 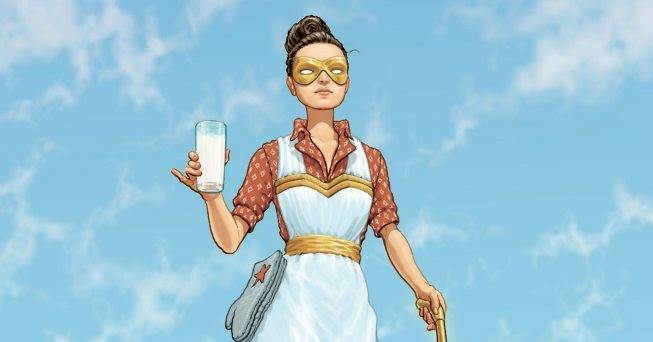 I’ve never really been all that interested in the big name publishers or long-running stories, never been into superheroes or anything like that. I always preferred indie titles which tend to be shorter runs. Saying that, maybe it would be cool to draw something like Sandman one day. JE: Are there any final thoughts you would like our readers to know? I suppose I’d just like to say I hope people enjoy the first issue, and that this will hopefully be the beginning of a really fun and interesting journey which will take on some of the most important topics which are increasingly relevant in our technological society today.If there’s anything I want to achieve it’s giving people food for thought about our status as human beings and what that means in a rapidly changing world. Be sure to support Reality Hackers on Kickstarter here. You can follow it on Facebook here. You can find Aimée McLernon on Twitter and their website.